The UTX FS is a lightweight long leg brace (also called KAFO, orthosis, or splint) and extension of the UTX line. 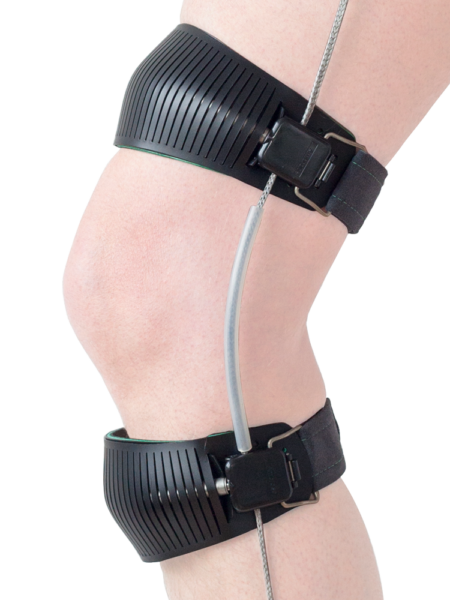 Standard the UTX orthosis is designed with a unilateral knee hine. This means that only on the outside of the knee a hinge is placed. That’s nice for you because the orthosis takes less space and therefore it’s easier to put a pair of pants over it and you can not knock with your other leg to the hinge at the inside while walking or sitting. It does mean that the UTX is less suitable for frontal loading, which happens if your knee is unstable in a knock-knee (genu valgum) or a bow-leg (genu varum). For those situations, the UTX FS option has been developed. With this option, the UTX is also suitable to provide stability at the frontal level, with a valgus or varus knee. The FS can be combined with all other variants of the UTX. The UTX FS is designed to provide stability in the frontal plane. This is necessary for people who have an unstable valgus (x-position) or varus (o-position) of the knee. This occurs with osteoarthritis of the knee. The cartilage of the knee is then degenerate. Usually, on one side of the knee, it is worse than the other side. If the degeneration is mainly on the inside of the knee, the knee will sink into the varus. As a result, the “bad” inside is even more loaded, which makes the degeneration process even faster. If the degeneration is mainly on the outside of the knee, the knee will sink into a valgus. If the complaints are limited to a valgus or varus of the knee, in most cases a knee orthosis, like the GENUX from Ambroise are choosen. In very severe cases however, one chooses a long leg orthosis (like the UTX FS). This orthosis has a longer frame than a knee orthosis and therefore provides more stability. In addition, we often see that severe valgus or varus of the knee is accompanied by the extreme inward rotation of the leg around the ankle at a valgus, or just turning out extreme at a varus. In those cases, correction is already advisable from the level of the ankle. The UTX FS can do that. This orthosis can be combined with the entire spectrum of ankle-foot solutions available at the UTX, for example, the UTX ESF, which supports the ankle with an AFO. This also prevents the rotation of the orthosis, which happens somtimes by knee orthosis. Incidentally, reduced function of the quadriceps (thigh muscle – responsible for keeping the knee stable while standing and walking phase) also often occurs in conjunction with osteoarthritis. This may occure because walking is more painfull, so you walk less, and the muscle weakens. If the quadriceps do not have enough function, there must be thought of the stability of the knee in flexion and extension. This can be done, for example, with the UTX SWING that has been specially developed to allow safe, stable and natural walking in case of reduced control over the quadriceps. Instability of the knee not only occurs in osteoarthritis. People who have walked for a long time with a knee that is unstable or less stable in flexion sometimes also develop an instability. That’s because the leg is consciously turning more outward (or more inward). This gives a slightly more stable position during the standing phase. In this way, the body compensates for the lack of control over the quadriceps. The price that the body has to pay for is that the load on the knee in the other plane (valgus or varus direction) is getting much bigger. This eventually leads to instability in valgus or varus. We see this for example a lot at polio and post-polio syndrome. The UTX FS is not suitable for valgus or varus instabilities bigger than 10° which can not be corrected to at least 10°. A valgus instability of 20°, for example, is not a contraindication, provided that the knee is redressable (able to push back) to at least 10°. How does the UTX FS work? The FS cable of the UTX FS ensures stability. The cable itself is very soft, but on top we added also around the knee area a flexible sleeve. With a simple, super light, soft-feeling but super strong cable, placed on the inside of the leg (at Valgus. At varus is the exact opposite), we have changed the stability of the orthosis in a surprisingly simple way. The cable can absorb very high tensile forces, which arise when the leg is loaded in the frontal plane in valgus. This way the lightweight frame can by adding a string of a few grams, suddenly stabilize a valgus knee. Smart mechanics. That’s just the way it is. The UTX FS cable has been extensively tested for strength and is strong enough for use in the UTX FS, see the video, which shows the cable is even too strong for our tensile tester. The UTX FS option can be combined with all versions of the UTX.